Jing, the Bandit King, is the star of his own TV series. 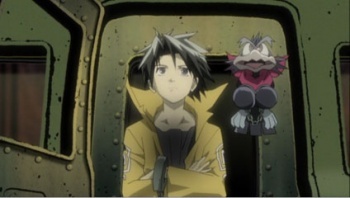 He travels with his best buddy Kir, an anthropomorphic crow who resembles a goggle-eyed Pokemon castoff. When threatened, Jing can slap Kir on his arm, and the bird's spine and ribs wrap around his arm to turn into a blaster cannon called the "Keen Royal." They fight crime! ... No, wait, they are crime - each episode, their goal is to steal some new and wondrous thing in a strange an exotic place. And by strange, we mean strange; the Jing TV series is full of exotic architecture, colorful bars, and weird. Jing has chosen some exotic thing to steal, and then he has to go get it, jumping through many hoops along the way. Jing: King of Bandits: Seventh Heaven is an original video animation (OVA) - three extra 30-minute episodes that went straight to the direct market. OVAs are known for having a much higher production value than a regular series: The colors are brighter, more tones are used, and fancy special effects are often abundant. When you're a big fan of a TV series, hearing that it's getting an OVA is usually cause for celebration, because you're going to get more of your favorite show, only even better. The first episode and third episodes of the OVA are about Jing getting incarcerated into the "Seventh Heaven" prison silo, a strange place full of colorful characters. How did someone as awesome as Jing get arrested? Simple, really - he deliberately got caught because he wants to steal from one of the inmates of the most secure prison in the world. His goal is nothing less than a wizard who captures dreams with his magic orbs. ... And unfortunately, Seventh Heaven is not a great anime. The fun of the Jing: King of Bandits franchise is watching our punk hero show up the older, rougher, tougher customers. He insults people until they fly into a rage, dodges their attacks with contemptuous ease, and then defeats them in a single blow. But in the "Seventh Heaven" OVAs, Jing spends the greater part of his screen time as an observer to his own plot, or as a jogger in interminable running scenes ... and when he is doing something, all too often it's extreme leaps of logic, such as knowing a new character's name despite zero clues. It doesn't help that his foe is just as boring - the wizard talks in annoying platitudes, and they both sleepwalk through their final confrontation, dumping a last-minute reveal that ends with uncomfortable schmaltz. The second episode is a flashback to Jing's early days as a 10-year-old, living in the woods with his entourage of fellow lost boys. They live like thieves, protecting a girl from a "tree spirit " that threatens to kidnap her. The kids steal an egg to give to Jing, which will later hatch into Kir. As an origin story goes, it's nice to see some details about the character - that is, if you care enough to find out, since you won't get any of the allusions unless you've watched the TV series. The middle episode contrasts strongly with the first and last - the younger Jing gets emotional, he shows loyalty to his comrades, he voices uncertainty about if he's doing the right thing ... in other words, he's an interesting and compelling character. The "Keen Royal" finishing move shows up in both the television show and the OVA. In the TV series, you clearly see the setup, with the strange metamorphosis of Kir from crow to gun; you also see not only the blast but also the exhausting fallout afterwards. In the OVA, the "Keen Royal" is repeated several times, with the same stock footage, and yet you barely see what's going on and it's over in an instant. And it's that one scene that sums up the problems with the OVA - it's there, it's the money shot of the show, but if you're not going to do it right or give a good reason for using it, what's the point? Bottom Line: For completists only, the Seventh Heaven OVA may have increased production value, but it's wasted on static characters, flimsy plot, and poorly-directed action sequences. Recommendation: Consider tracking down the original Jing: King of Bandits TV series, instead. Norman Rafferty can perform a 0.3-second quick-draw, and he shoots with amazing accuracy, aided by the brim of his hat.